The winery’s largest production (about 40.000 bottles per year). It is made from Sangiovese 100%. The wine spends one year in barriques before being aged in bottle. 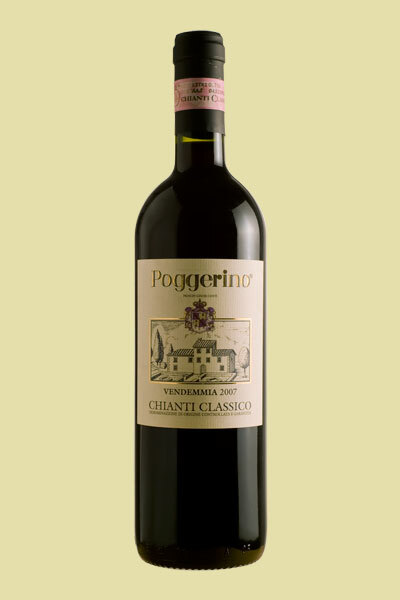 Its colour is light ruby, with aromas of blackberries, cherries and redcurrant, with a touch of licorice and vanilla spice. The tannins are sweet and persistent. Recommended with spicy-sauced pasta and mild-tasting red meats. Mi piace molto il Poggerino! Bright and well-endowed with pure cherry, raspberry and black currant fruit, shaded by tobacco, licorice and mineral flavors. Elegant, intense and persistent, with a long aftertaste of fruit and mineral. This should age well, but a trade-off to lose that beautiful fruit now. Best from 2015 through 2023. 3,500 cases made.—B.S.